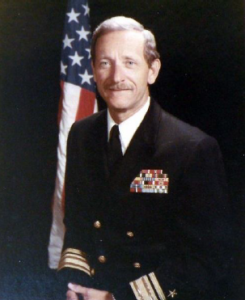 RADM Reuben Goodwin Rogerson was born in New Orleans, Louisiana and entered the Navy in the fall of 1942 through the Naval ROTC Program at Tulane University, New Orleans, Louisiana. His first assignment upon being commissioned an Ensign was with the Staff, Commander Seventh Fleet. He remained in this assignment until February 1945 when he reported to USS LST 458. Upon his release from active duty in June 1946, RADM Rogerson while in an inactive status in the Naval Reserve, attended the University of Texas. Upon graduation and subsequent return to active duty during the Korean conflict in July 1950, RADM Rogerson served in USS LST 1082 as First Lieutenant and Gunnery Officer until July 1952 when he reported to USS LUZERN COUNTY (LST 902) as Commanding Officer. Following a two-year tour as Commanding Officer, U.S. Navy and Marine Corps Reserve Training Center, Austin, Texas, Rear Admiral Rogerson reported to USS B (DD 630) as Gunnery/Operations Officer. In October 1957, he was assigned to the Staff, Commander Amphibious Force, U.S. Pacific Fleet as Force Gunnery and ASW Officer. From June 1960 until August 1961 he served as Executive Officer, USS SPROSTON (DD 677) followed by duty as Commanding Officer, USS RUPERTUS (DD 851) from August 1961 until March 1963. RADM Rogerson then was assigned to the Office of the Chief of Naval Operations Plans and Policy Branch, Progress Analysis Group until June 1965. He attended the School of Naval Warfare at the Naval War College, Newport, Rhode Island from June 1965 until June 1966. Following graduation from the Naval War College, RADM Rogerson reported as Commander Destroyer Division 212, serving until June 1967 when he reported as Operations Officer and subsequently Chief of Staff and Aide to Commander Amphibious Group One. In May 1971, RADM Rogerson took command of Amphibious Squadron Five and served as Commander until his assignment in June 1972 as Chief of Staff and Aide to the Commander Amphibious Force, U.S. Pacific Fleet. In June 1973 RADM Rogerson took command of the combined command of the Naval Inshore Warfare & Amphibious Group Eastern Pacific. RADM Rogerson was appointed to his present rank in September 1973. As a result of the realignment of the amphibious force and disestablishment of Naval Inshore Warfare & Amphibious Group Eastern Pacific, RADM Rogerson, on 1 April 1975 assumed command of the newly created Amphibious Group Eastern Pacific. RADM Rogerson assumed the position as Deputy Commander Naval Surface Force, U.S. Pacific Fleet on 25 August 1976. Personal decorations include the Legion of Merit and Combat “V” and a gold staff in lieu of second award, two Meritorious Service Medals, the Bronze Star with Combat “V”, the Navy Commendation Medal and the Combat Action Ribbon. In addition to campaign and service medals, RADM Rogerson has received the Navy Unit Commendation as well as the Republic Vietnam Cross of Gallantry.